Trail Mix-Up (film) Roger Rabbit cartoon; released on March 12, 1993. Directed by Barry Cook. 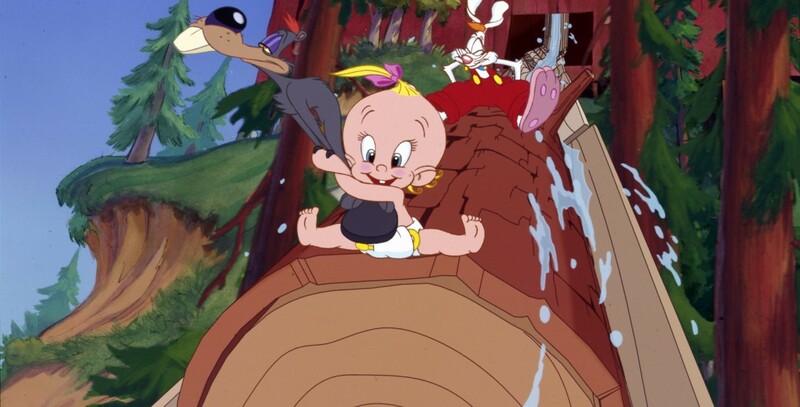 Roger Rabbit is left to care for Baby Herman in Yellowstone National Park. When Baby Herman’s curiosity gets the better of him, Roger is plunged into all sorts of zany adventures. He upsets a beehive, meets a tree-hungry beaver, and has several misadventures with a sawmill that conclude with Roger being sawed into hundreds of tiny Rogers. Roger, Baby Herman, the beaver, and an angry bear are saved from going over a waterfall only to plummet over a cliff. They land on a geyser that shoots them all into the faces carved on Mount Rushmore, ruining the national landmark. Voices by Charles Fleischer, Kathleen Turner, April Winchell. Produced at Disney-MGM Studios in Florida. Originally released with A Far Off Place.